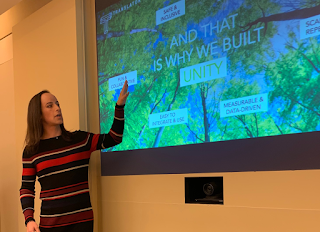 nglccNY News Blog: The 2019 nglccNY Biz Pitch Launches with a New Twist! The 2019 nglccNY Biz Pitch Launches with a New Twist! Changing things up from 2018, our sponsor for the nglccNY Biz Pitch, EY, decided to hear presentations from four, rather than three, suppliers at the January 22, 2019 Biz Pitch. Incredibly, two of them were awarded the opportunity to return in December to compete for prizes. Last year only one business per competition advanced to the final round. Reinforcing its commitment to mentoring nglccNY’s LGBTBEs, EY will similarly award two suppliers at both the June and September pitches. With six suppliers competing for prizes in our final contest in December, we suggest you all block out the entire afternoon and evening of December 11, 2019! It will be a pitch event (followed by M3) you will not want to miss! Natalie Egan pitches her LGBTBE Translator LLC. On January 22, we heard from Dr. Gerry Goldhaber who educated us on being an expert witness, news commentator, and one of the country’s leading safety warnings communication experts. We also listened to Shana and Amy Scott of mOdat Productions who produce premium, high quality digital and broadcast content for virtually any outlet. Additionally, the audience took in pitches from Natalie Egan of Translator LLC who is redefining how corporate America, schools and non-profits provide diversity and inclusion education, and Ben Conard of Five North Chocolate who sells healthy, fair trade chocolate snacks and is the first LGBTBE to display the NGLCC certification on a retail package. LGBTBE Owner Ben Conard shares the journey of Five North Chocolate. 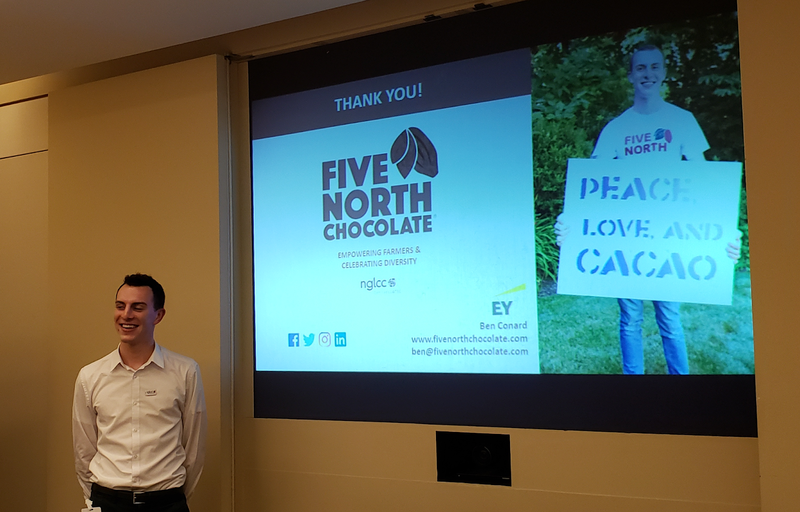 After much deliberation, the EY panel of judges announced to participants and more than 30 spectators in attendance that the winners of the first nglccNY Biz Pitch of 2019 were Natalie Egan of Translator LLC and Ben Conard of Five North Chocolate. Congratulations to both Natalie and Ben on being selected to pitch again and December, and congratulations to Gerry, Shana, and Amy for your excellent pitches! Our next Biz Pitch is set for June 4, 2019. (Invitations to apply will be sent in April.) To better understand the benefits of participating in the nglccNY Biz Pitch (in addition to competing for prizes), we encourage you to read our article from November 2018, EY’s Biz Pitch Competition Helps LGBT-Owned Companies Up Their Game, or feel free to send me an email at rob@nglccny.org.